Shure’s new SE115m+ earphones are a slight upgrade to the SE115 model and are also quite similar to the SE110 earphones we previously reviewed. The new model is mainly set apart from its predecessors due to added support for compatibility with mobile devices. Specifically, the a new integrated 3-button remote now works with Apple’s iPhone and iPods. With a built-in microphone, the SE115m+’s make it easy to answer calls or even use voice commands. In terms of audio quality, this headset is a vast improvement to the ubiquitous white earbuds included with Apple iPods. The SE115m+ utilizes Shure’s second generation dynamic driver versus the balanced armature driver featured on the SE110, but both have the same state frequency range from 22 Hz to 17.5 kHz. 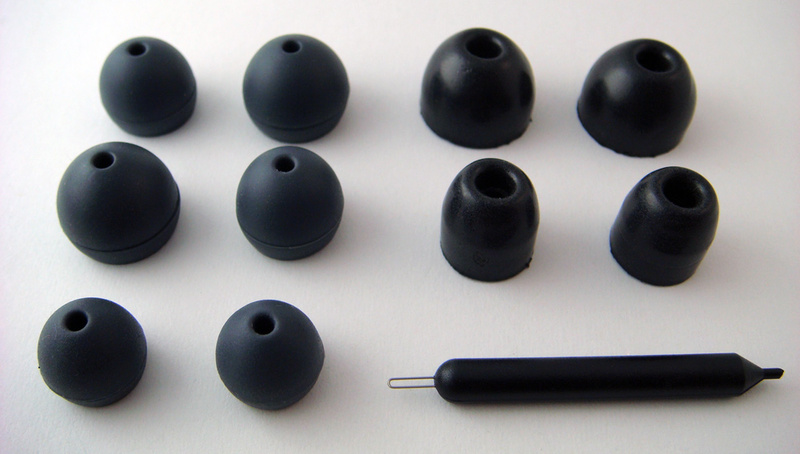 As with any pair of Shure headphones, there’s plenty of included tips: a set of rubber and foam tips in small, medium, and large sizes. With the variety of tips included, it’s almost guaranteed that there’s a size to fit anyone. If you still can’t find your fit, Shure offers additional sleeves such as tri-flanges on their website. A tight and comfortable fit is important since it’s essential to retain sound isolation from external detriments. There’s a small cleaning tool to remove any ear wax or dirt that may have entered the headset. Keeping the inner tube that reaches the speaker clean helps deliver unobstructed audio. 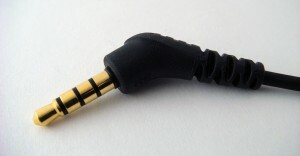 Compared to most Shure headsets which offer a modular cable that disconnects right before the ‘Y’ split, the SE115m+ is a single 54 inch cable. While some may not have an issue with it, I felt as though it’s a neat safety precaution that won’t damage the audio port on your device since it can de-attach easily with a forceful tug. A shorter cable is also handy especially if you’re connecting your iPhone or another device to an armband. Moving forwards, the only other item included in the packaging is a soft-case to protect your headphones and store those extra sleeves. Aside from audio quality, the next most important aspect of the SE115m+ is the remote control featuring compatibility with Apple’s 3-button system. The buttons work in the same manner as the Apple earphones that have a remote and microphone. Answering and making calls are simple and easy, but difficulty comes when navigating an iPod. The issue arises because the top and bottom button are solely used for adjusting volume, making the rest of functions completely reliant on the single center button. This can get confusing quickly. I should mention that this isn’t Shure’s fault, but rather Apple’s weird way of trying to simplify things. While confusing, the button is easy to find, feels good, and works well. On the other hand, the volume buttons aren’t too well though through. Taking a closer look, you’ll notice that those two buttons are nearly flush with the casing. That means when you aren’t looking at the controller, it’s often difficult to feel where those buttons are. While Shure emphasizes compatibility with Apple products, these will still work just fine with other devices featuring a 3.5mm headphone jack. However the controls might not necessarily function as intended. In terms of audio quality, the SE115m+’s offer incredible value. The SE115m+’s aren’t exactly high-end headphones, but are a great option for those making their first steps into the realm high quality audio. In comparison, these in-ear-monitors will sound vastly superior to the earbuds included with an Apple product, BlackBerry device, Microsoft Zune, or any other digital audio player. 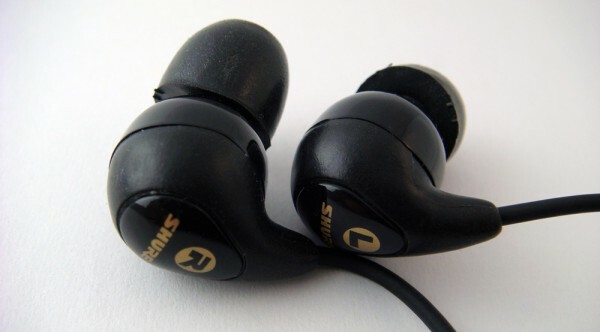 If compared to the now-discontinued Shure SE110 earphones, the SE115m+ clearly have a fuller bass with a wider soundstage due to the new second generation dynamic driver. 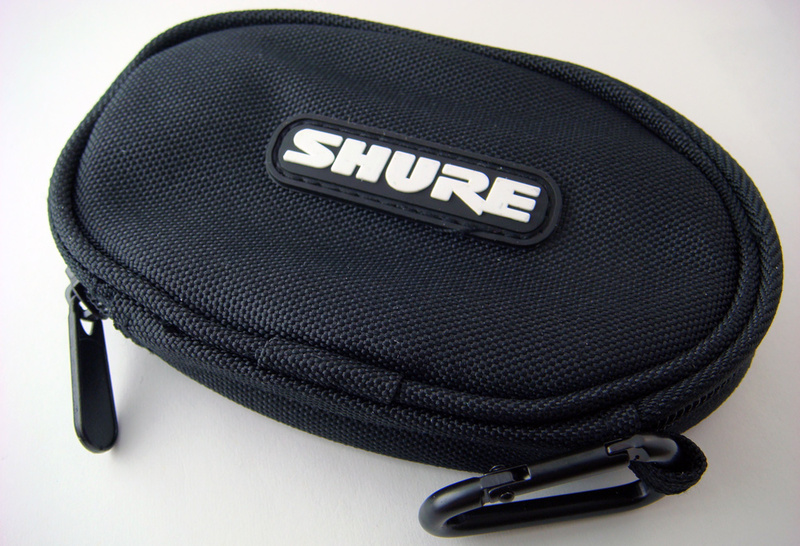 Although it’s great for music with a low beat, I would have liked to see Shure increase the quality of the high and mid range audio. Unfortunately this is where the SE115’s begin to falter. I also found the quality of vocals to be less than expected. While these are supposed to be used for phone calls in addition to music, I expected better audio quality, especially for vocals. 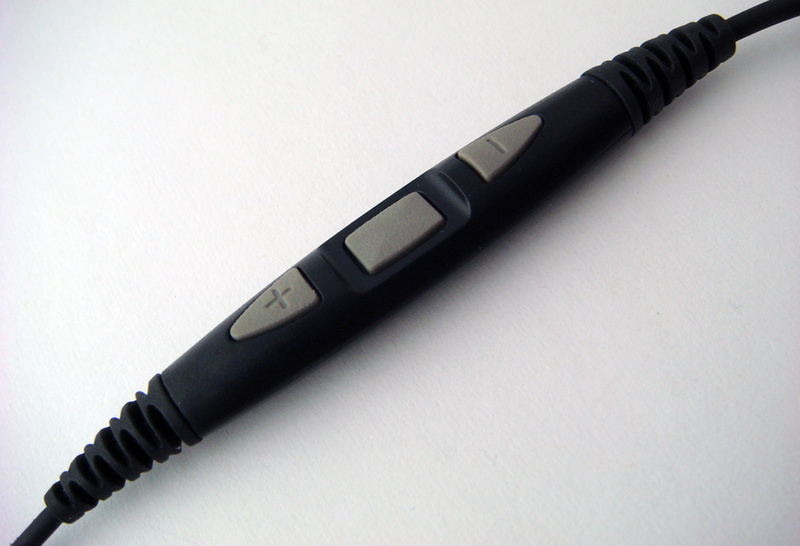 Making audio calls with the built-in microphone showed the strengths and weaknesses of the SE115m+. The microphone was actually quite good and other listeners were able to hear me quite well. In contrast, it seemed as if the incoming call quality was directly related to the disappointing vocals while listening to music. People sounded higher pitched than normal and almost tinny. Seeing as being able to make phone calls is one of the distinguishing features of the SE115m+, the call quality was disappointing. 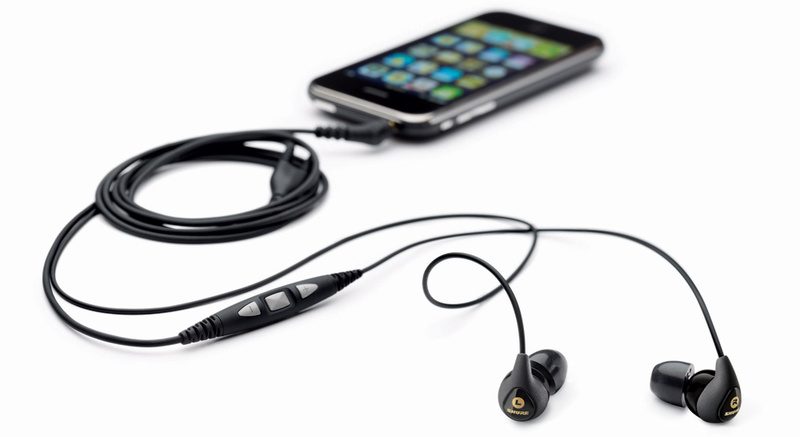 For those looking for an entry-level earphone, skip the SE115m+ and move along to the SE210 earphones. While better than the SE110, they succeeded, the SE115m+’s price is nearly the same as that of the SE210 to justify going for that one instead. However, if you own an Apple iPhone or iPod Touch, the SE115m+ offers special functionality which is worth consideration. Shure is a reputable brand name and these will work as advertised, although don’t expect crystal clear calls. The SE115m+ have been available for retail through Apple Stores for a short period and are going on sale through Shure.com and at other retailers this month. Amazon has it available on pre-order for an MSRP of $119.